This weekend is Palm Sunday, celebrating Jesus Christ’s triumphal entry into Jerusalem and the beginning of what Christians call Holy Week. The great irony of Palm Sunday is that many of the Jewish residents of Roman-occupied Jerusalem who waved palm branches cheering Christ’s entry turned against him only five days later shouting, "Crucify him! Crucify him!" in response to Pontius Pilate the Roman prefect (Luke 23:20-22). A few years ago during Eastertime at our neighborhood Kilwins — a national ice cream and candy chain — they were selling chocolate crosses alongside the bunnies and marshmallow eggs. My husband and I assume that Kilwins must have received complaints because never again have we seen this edible travesty — but we still check every year. On a Sunday in Jerusalem over 2,000 years ago, there occurred what members of the world’s largest religion believe was a miracle that changed the course of human history — the resurrection of Jesus Christ. An event that was of such magnitude that it “divided time” between the ancient centuries and the modern era. Now, considering Jesus Christ’s past and present impact on mankind, one would think that God could have left some physical evidence of His resurrection, especially geared to non-believers. And, that is precisely why millions of Christians around the world, my husband and myself included, believe that the Shroud of Turin— purported to be the authentic burial cloth of Jesus — is that physical evidence. Known for its numerous mysterious properties, the Shroud is a linen cloth measuring 14.5 feet by 3.5 feet, with an anatomically correct, front and back mirror image of a crucified man. It is also the world’s most studied, analyzed and revered artifact that continues to baffle scientists and religious leaders, Christians and non-Christians alike. The first mention of Christ’s burial cloth in Luke (23:53) — “wrapped it in linen cloth,” — refers to his dead body. After the resurrection, the “linen” is found in the empty tomb, along with "the cloth that had been wrapped around Jesus' head" and “separate from the linen” (John 20:6-7). 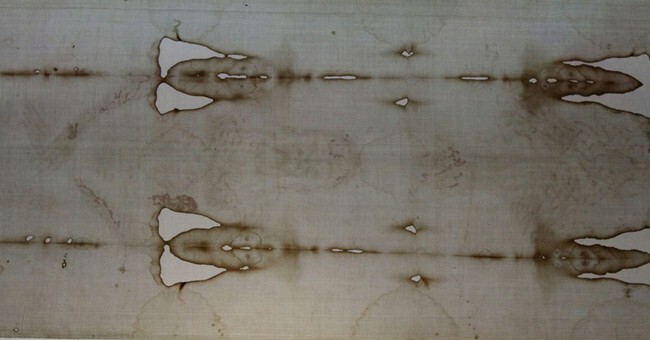 The “forgery” argument stems from the controversial 1988 carbon-14 test that dated the Shroud to between 1260 and 1390. However, over the ensuing decades, the test’s conclusion has been debunked by numerous scientists because the piece tested may have been subjected to a medieval reweave or repair, as determined by chemical analysis in 2005. Among the Shroud’s most prominent and visual mysteries are the unexplained photographic properties that came to light in 1898. Such properties nullify the “medieval forgery” argument with just one look by providing believers with a real human face to contemplate. It was May of 1898, and the Shroud of Turin was on a rare public display in Turin, Italy when a lawyer named Secondo Pia was granted permission by church authorities to apply the “new technology” of photography to the cloth. After the photo session, Pia was astonished to discover in his darkroom that the faint yellowish Shroud image emerged from the negative plate as a much sharper life-like “positive” image. We now know that the Shroud image seen on the cloth is actually a photographic negative which turns positive when reversed by the camera. And on that positive image, Pia first saw clear details of the infamous torture endured by Christ on Good Friday — over 100 scourge marks, blood from the crown of thorns pushed into his scalp and the nails of crucifixion. Naturally, the church authorities were shocked and did not know what to make of Pia’s discovery. He was even accused of manufacturing the image! Thus, the question: How could a “forger” between the years 1260 and 1390 produce an image of a crucified man on a cloth with such mystifying photographic results given that the world's first photograph was not taken until 1827? Also, keep in mind that the Shroud’s unexplained photographic properties are not even the most perplexing of the cloth’s many mysteries. The top award goes to the basic question “How was the image formed?” A front to back linear image that perfectly corresponds to all the Gospel’s accounts of Christ’s torture and death on the cross. Contemplate your answer if your Sunday plans include waving a palm branch — and consider it even more if they don’t.